Natural citrus oil degreaser for heavy duty cleaning. Free from petroleum solvents. Effective. Simply brush on and rinse off with water. Economical. May be diluted with up to 10 parts water. HEAVY DUTY DEGREASING: Use undiluted mop or spray on. Brush if necessary to loosen impacted grease and dirt. Rinse thoroughly with water. GENERAL CLEANING/DEGREASING: Dilute with up to 10 parts warm water. Mop or scrub as necessary to remove soilage. 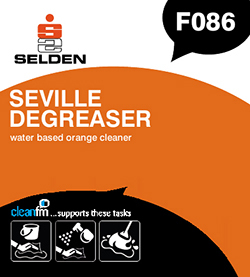 Seville Degreaser is suitable for use with suction dryers. Always rinse thoroughly with clean water after use.